The all-new MixPad® MXP144 14-Input Analog Stereo Mixer demonstrates Samson's commitment to quality, affordability and professional specs. 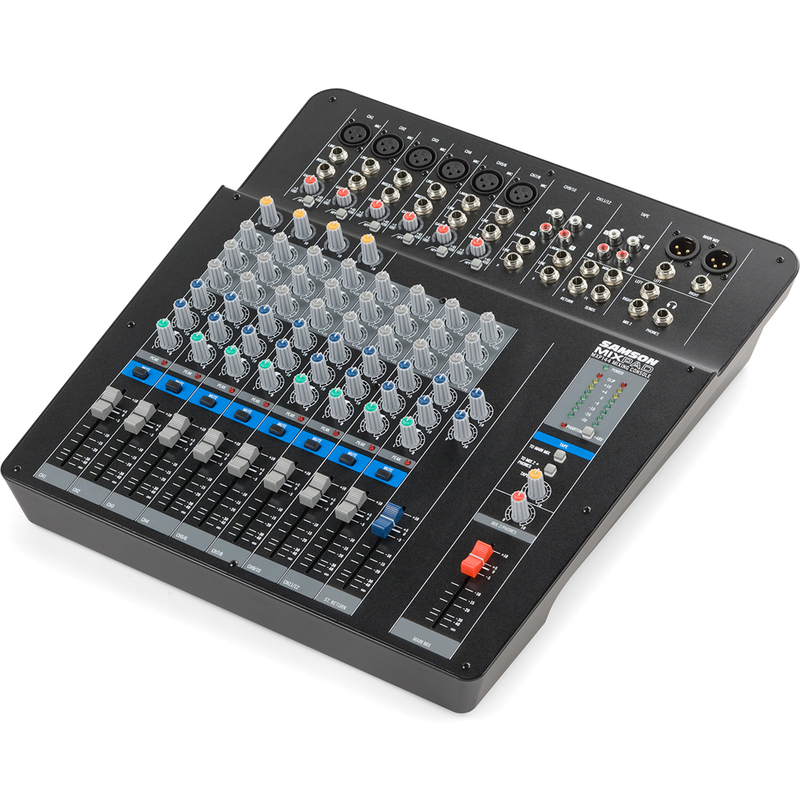 This lightweight mixer offers all of the sonic clarity, ease of use and premium performance that serious musicians demand. The MXP144 features premium circuitry specifically designed to work with Samson's MDR (Maximum Dynamic Range) mic preamps to provide wide frequency range, definitive channel separation and natural response. This ensures that all of your mixes originate from pure, authentic audio signals, making the MXP144 perfect for education, broadcast, band rehearsals and other live sound applications. The MXP144 offers six MDR mic preamps with four of the channels equipped with single-knob compressors for studio-quality dynamic control without the non-stop tweaking of external gear. All channels on the MXP144 are controlled via precision 60mm faders and feature a 3-band EQ, Gain trim, high pass filter and mute switch. 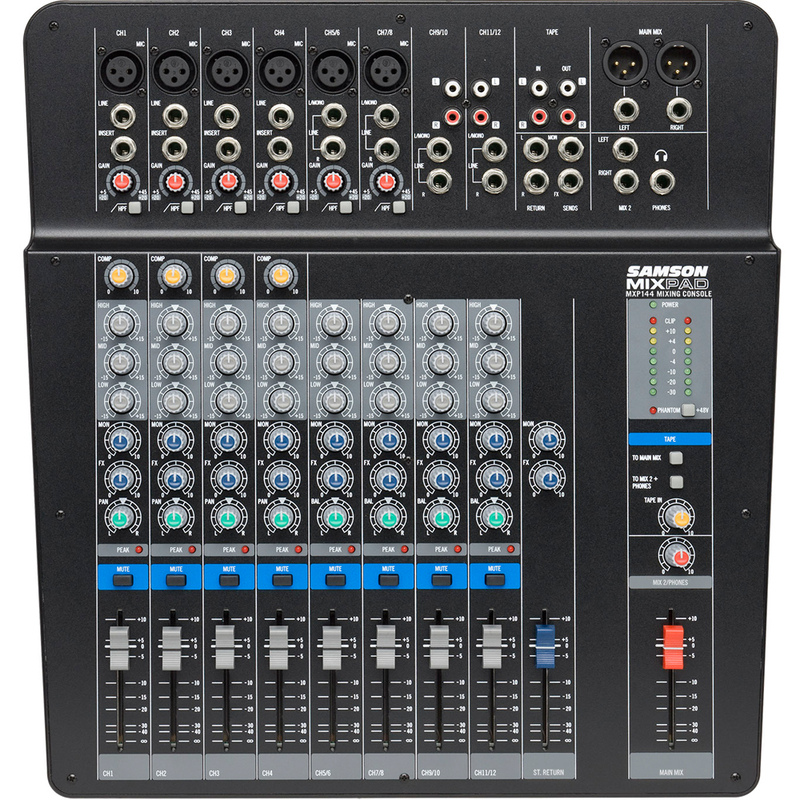 In addition, each channel on the MXP144 has a pre-fader Aux send for your monitor mix and a post-fader Aux send for introducing external effects. Exceptional output flexibility makes the MXP144 a worthy companion regardless of venue size, giving you precise fader control over your Main Mix (XLR and 1/4" outs), as well a Mix 2 output, headphone (Phones) monitoring with level control and a RCA Tape out for recording your performance. The MXP144 has selectable 48-volt phantom power so you're free to mix in the warm, natural response of your favorite condenser microphones. Further catered to live performance, the MXP144 includes brightly colored knobs, as well as 8-segment LED level metering for safe and efficient operation in dark environments. Portable, easy to use and jam-packed with features that ensure optimal control over your performance, Samson's MixPad® MXP144 represents a new era of possibility for affordable live mixers.